Rptstoy1 - Brian Enos's Forums... Maku mozo! Does the PT evo grip fit like a glove in the PT block option without having to file anything? I got a Chaos and had to file the PT block on the RM and Limcat holster too. I’ve been shooting for years now, have used different holsters, no issues shooting sti/sv grips. Got a new Atlas with an evo grip.. replaced my daa insert to a PT compatible but for the first time, I’m not getting a consistent drawing.. it gets stuck, Gun not smoothly coming out. Is there a daa insert specifically for Evo grips or the PT inserts should work? Or is there any other holster in the mkt best for the Evo grips? Thanks for any help. Rptstoy1 replied to blkrifle's topic in Match Announcements - Pistol Only - USPSA, IPSC & Misc. Are the stages posted anywhere ? 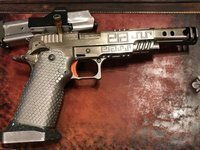 Rptstoy1 replied to twodelta's topic in Match Announcements - Pistol Only - USPSA, IPSC & Misc. Is that on Eastern time zone? Rptstoy1 replied to j33716's topic in Match Announcements - Pistol Only - USPSA, IPSC & Misc. Rptstoy1 replied to JulieTheCat's topic in Match Announcements - Pistol Only - USPSA, IPSC & Misc. Not that ridiculously Fast but it will sell out in time. Rptstoy1 replied to JakeMartens's topic in Match Announcements - Pistol Only - USPSA, IPSC & Misc. You have not send any pin codes yet right? Rptstoy1 replied to SVB's topic in Match Announcements - Pistol Only - USPSA, IPSC & Misc. Rptstoy1 replied to Stage 3's topic in Match Announcements - Pistol Only - USPSA, IPSC & Misc. Yup.. Everyone's OK.. Good thing nobody was standing to the right of the RO, the bullet hit about 8 ft to the right of the shooter. DQ video posted on TN section FB..